Flying a kite is the quintessential childhood activity. There’s nothing quite like spending a breezy day outside, running and laughing with friends. But did you know that 90% of early elementary school children have never flown a kite? Here at Kites in the Classroom, we’re bringing back the joy of kite flying. For over 20 years, we’ve been contributing to the success and happiness of children around North America. Our kite kits are creative teaching aids that have been purchased by over 9, 000 schools and flown by over half a million children. Want to hear what teachers, students and parents are saying about our kite kits? One of the biggest challenges teachers face is finding the perfect balance of learning and fun. Our kite kits are affordable creative teaching aids that will intrigue and inspire. Not only are they exciting to build and fly, but they also offer an incredible range of project ideas. Kites can be used as a vehicle for lessons on history, physics, earth science, aerodynamics, mathematics and even creative uses of graphics and colours. The range of learning offered by the humble kite is astounding. Teachers need to set parameters around the kite as an activity that is both stimulating and of long-range value to the learner. There are three approaches to the use of kites in the classroom. focusing on what you enjoy and want your students to know. Develop a mini unit around the kite focusing on one dimension, say, the physics of flight, or several dimensions, say the origin of kites in China, and the history of kites. Kites and kiting can be a direct teaching tool, using approved pedagogy and methods of evaluation. Lessons learned can be indirect, that is, kiting can open the mind of kids to the greater world of scientific discovery and technological inventions, while contributing to more social dimensions of learning, and above all, to the experience of life in nature, which always includes life against nature. The most immediate goal of a kite unit in the curriculum should be to further an ordered and disciplined approach to the acquisition of skills. We need not tell you that learning is very individual. The originality and beauty of the kites made in the classes we have attended would make an artist envious. On the other end of the spectrum, we have helped kids tie their first knot in a line. Well, both found pleasure in the activity, and both learned something of value. 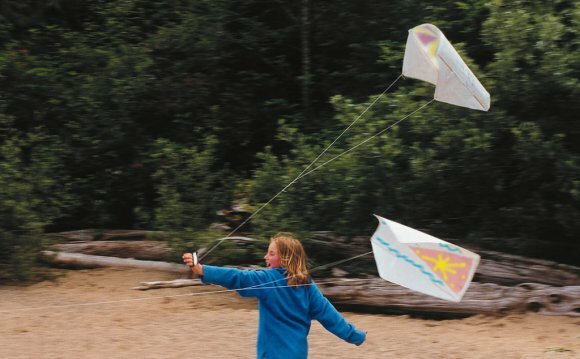 Classes, or projects, involving kite making and flying elicit immediate fun, challenge and excitement. The reward is immediate too. In elementary grades, many parents and guardians join our classes, which makes the kiting day a real event in the life of the children. Each of our kite kits comes complete with everything you need to successfully assemble and fly a kite, plus a Curriculum Support Guide that includes a variety of suggestions on how to make this creative teaching aid both fun and educational.